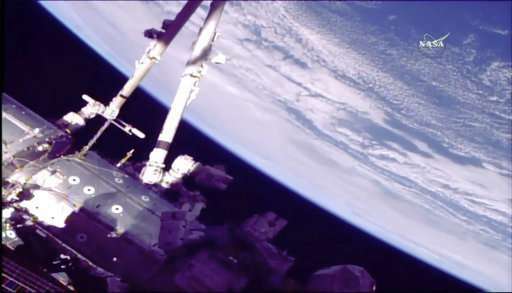 The Canadian-built, 58-foot robot arm had both of its aging mechanical hands replaced on spacewalks conducted in October and January. NASA astronaut Mark Vande Hei and Japan's Norishige Kanai quickly moved one of those old hands to a long-term storage location outside, and took the other one inside so it can be returned to Earth for a tuneup and then flown back up. This last spacewalk in the series should have been completed long before now, but was postponed because of complications with the robotic hand that was installed last month. Ground controllers eventually solved the problem. Further delays were caused by this week's late arrival of a Russian supply ship. The old mechanical hands are original space station parts, in orbit since 2001. Each hand—a bulky bundle of latches—is more than 3 feet, or a meter, long and more than 440 pounds (200 kilograms). Vande Hei and Kanai accomplished their main objectives so fast that they had time to tackle extra chores. They breezed through those as well, allowing the spacewalk to end a little early, at the six-hour mark. "Awesome job again, with everything completed," Mission Control radioed. "We're all happy here." Replied Vande Hei: "It was great to be a small part of a team in space representing a whole space team on the ground." The astronauts marveled over the Earthly vistas, from start to finish. They emerged from the orbiting complex as the sun rose over Peru, 250 miles below. A half-hour later, they were soaring over London and, 15 minutes after that, over Turkmenistan. "It's an amazing view over someplace that's got lots of snow," radioed Vande Hei, making his fourth spacewalk. He returns to Earth at the end of this month. It was the first spacewalk for Kanai, a surgeon who arrived at the space station in December. Akihiko Hoshide, an experienced Japanese astronaut who previously visited the station, relayed directions to the spacewalkers from Mission Control in Houston. Kanai became the 220th person to conduct a spacewalk, according to NASA statistics. Four other men live at the space station.